I remember the walk up the steep Spanish Steps at the Piazza di Spagna on our 5th day of the pilgrimage. I could no longer count past 10. My feet were aching from the long day of touring Rome. There were rose vendors who suddenly handed us roses and asked for change to pay them for a stem. But we had to reach the top by 5pm or we will miss the bus back to the hotel. I find myself reminiscing these moments because they're the most recent memories that offer my mind a place to breathe. I found this lost petal in the photograph enchanting with a backdrop view of the Vatican panoroma. I took this photo because I wanted to be reminded that even fragile things such as crumpled petal is gifted with beauty when seen against the whole landscape of the city of Rome. Nothing is wasted in His creation. Everything is touched by His fingerprints. So everything bears a mark of His glory. These are heart whispers that help me surmount the doubts that have been nagging at me the past few days. Will I live to see a breakthrough? Will I survive the heat and not be burned? Will I reach the destination and recognize myself transformed? Then I find this. This photograph is just one of the snapshots that I have not been able to completely sort through since I came back to work. I find this memory tucked in files of edited photos and remember that I came back from the pilgrimage strong in my belief that I am held by grace. That when I walk through my days I can walk free. It remains to be an effort. Most times, it is a struggle. Just today I heard more news of work issues that I no longer can find solutions for. I am officially helpless and awaiting redemption. But I keep writing so that I can believe that every word that comes out of me continues my fight for joy. I fight against these doubts. I fight against these fears. And this fight is a battle. 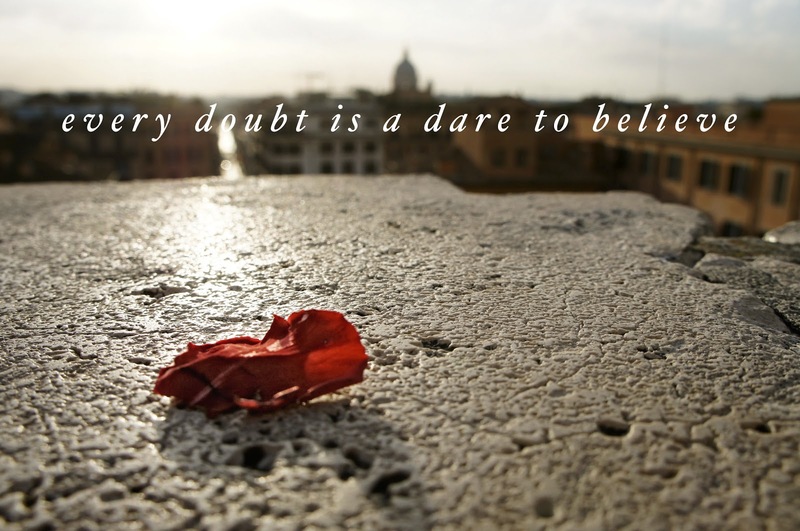 The dare to believe. I walked up those Spanish Steps not believing I could reach the top. Worn down by my own physicality, I was afraid of running out of breath and receiving taunts about how much weight I've put on that I can barely crawl my way to the top. But I moved at a pace lifting one leg infront of the other. Stopping when I need to stop and moving up when I my strength returned. I suppose this is the same rhythm of life. There is nothing wrong with slowing down. There is nothing wrong with admitting you need a different pace. It's not a sign of failure. Sometimes the greatest act of faith is in stopping instead of striving. Giving room for the ways of God to move as you believe He would. Hi Lisa, thank you for dropping by. I'm glad you found consolation here. You offer so much wisdom, here, relating to perspective. One step at a time is so very often enough...especially with the Lord.